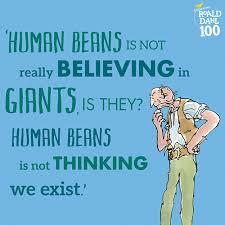 If the genius that was Mr Dahl was alive today, this year would have marked his 100th birthday. 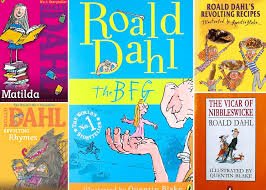 In celebration of his life, Devonshire Libraries, and many other libraries cross the UK, are remembering his work with a Dahl themed summer reading scheme. As part of this scheme, I was honoured to be invited along to the Tiverton and Cullumpton Libraries in Devon recently, to teach two Gobblefunk workshops. Roald originally came up with the idea after his first wife, actress Patricia Neal, became very ill and wasn’t able to talk properly. They made up their own language so that they could speak to each other. Roald thought having a language that mixed up words and sounds was such a brilliant idea, that he should invent a character who spoke that way. A few years later, along came the BFG. Dahl created his Gobblefunk words by pulling three different words, or parts of words (such as ing, ly, ter, y), out of a bag of words he kept in the shed where he wrote. He placed these words all together on the tray he rested on to write, and used them to make up a completely new word, to which he then gave a meaning. 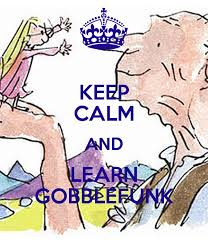 Next time you write a story, why not use Dahl’s Gobblefunk to help you? why not? Life’s short – enjoy words more! All you have to do is write out a selection of your favourite words on individual pieces of paper, along with some word endings, and mix them up in a bag or a hat. From then on, whenever you need the name of a place, a thing, a creature, a feeling- or anything else you like- you can pull two or three words out of your bag, put them together, and have fun deciding what your brand new word would mean! What could a Runnyflopter be? A monster? A bunny rabbit with massive ears? A vat of oozing potion? When you add some Gobblefunk to your stories, you can let you imagination run wild!